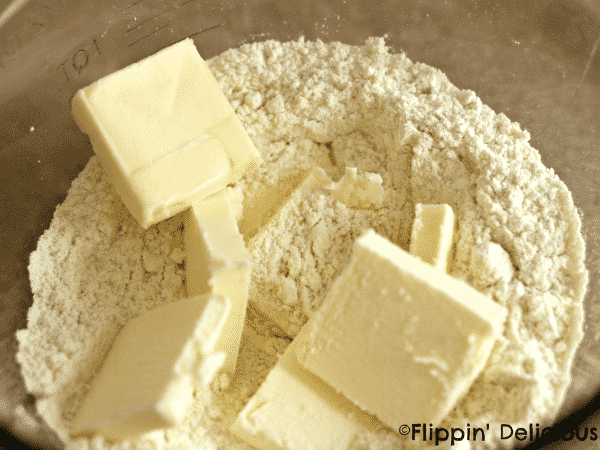 This truly is the best all-butter flaky gluten free pie crust recipe. Oh so tender, flaky, and it holds up well enough you can pick up a piece of pie with your hand. Buttery pie perfection right here! If you are like me, you have probably searched hi and low to find the perfect gluten-free pie crust for your holiday pies. I’ve made my own pie crust the last few years, and I’ve been semi-satisfied. Just semi-satisfied. I seemed to either be missing the buttery flake, or result in a pile of crumbs. I hadn’t figured out how to get a pie crust that could hold up AND have that buttery flakiness AND tender bite all at the same time. Until now! The ultimate flakey gluten free pie crust! This is the Gluten Free Honey Pumpkin Pie that I made using this recipe. I based the recipe on a pie my dad would make for me when I was a little girl. It is my favorite! When making a gluten free pie crust, the flours make all the difference. 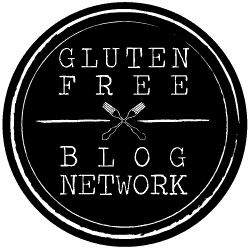 Please don’t try and use an all-purpose gluten free flour for this recipe. Don’t get me wrong, I LOVE my rice flour blend. It is still my go to for cakes, cookies, muffins, and the like. For pie crust you need a lower starch content. 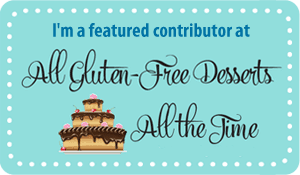 I tried my friend Megan’s Dairy Free Gluten Free Pie Crust and I was won over! On to the flaky gluten free pie crust recipe! I don’t personally have any issues with dairy, so I adapted Megan’s recipe to create my perfect flaky gluten free pie crust by adding ALL THE BUTTER. I’ve also made this gluten free pie crust recipe with half butter and half lard. I know, lard may sound gross if you haven’t used it before, but give it a shot. Lard makes the pie crust even more flaky! The baked gluten free pie crust is full of butter, has a tender bite, is super flaky, and just pure amazing! One secret to making the perfect flaky crust is to make sure your butter and water are VERY cold, and then be careful to only lightly work the dough. Leaving larger chunks of butter in the dough also helps the crust to have that flakiness that we all desire. Add the apple cider vinegar and ICED water (literally- it should have ice cubes in it) just a little at a time and work it just enough for it to come together into a ball. You want to have a really gentle hand to keep those chunks of butter. Another one of my tips is to use plastic wrap to form the dough into a disc (so that your hands don’t melt that beautiful butter.) Chill it all the way through before rolling it out to keep those chunks of butter. Those butter bits melt as the gluten free pie crust bakes and THAT is what makes the pie crust flaky. 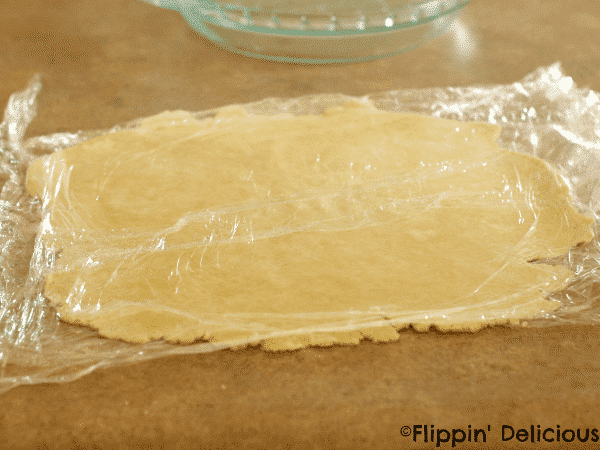 Roll the dough out between 2 pieces of plastic wrap! 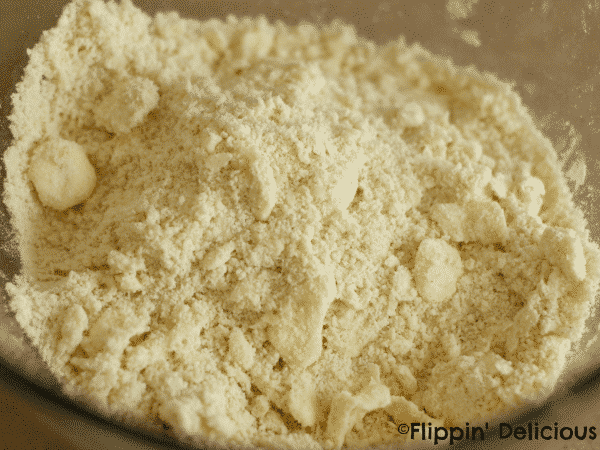 I want to avoid adding any extra flour to my pie crust, that can quickly make a flaky gluten free pie crust a crumbly mess. Also, plastic wrap makes clean up a breeze! Then just move the dough to the pan and fill with your favorite pie filling. If you want to make a pie with a top crust, or are making several pies at once just multiply the recipe by the number of single layer crusts you need, and then divide the dough into that number of discs. This really is the best all butter flaky gluten free pie crust around! This truly is the best all-butter gluten-free pie crust. Oh so tender, flaky, and it holds up well enough you can pick up a piece of pie with your hand. Buttery pie perfection right here! In a medium-sized mixing bowl whisk together the flours, xanthan gum, and salt. Add the butter and using a pastry cutter or 2 knives cut the butter into the flours until it looks like very coarse crumbs with some large chunks of butter about the size of your fingernail(see picture). Add the apple cider vineagar, and then add the ice water 1 Tbs at a time, mixing lightly with a fork until it starts to pull together into a crumbly looking dough. If you pinch in between your fingers it should easily come together into a dough. It took me 3 Tbs of water, but depending on your climate, your flour, and the weather you might need more. Dump the mixture onto a large square of plastic wrap, and use the plastic wrap to form the dough into a disc, handling it as little as possible. 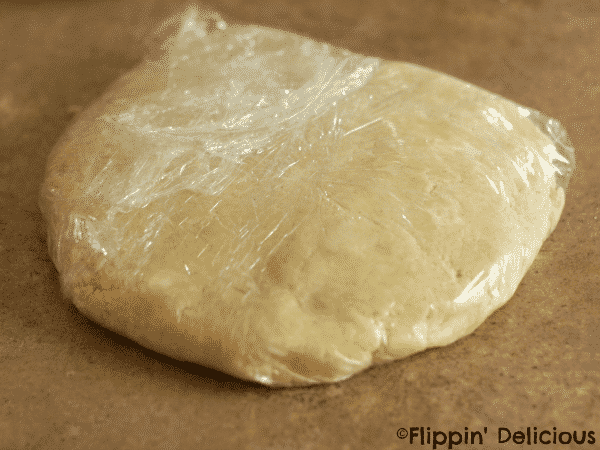 Roll out the disc of dough between 2 large pieces of plastic wrap or parchment paper until it is ⅛-1/4" thick. Remove the top sheet of plastic wrap and transfer the crust to your 9 inch pie pan buy lifting the crust up, using the bottom sheet of plastic wrap, and then flipping it over into the pan. Gently press the crust into the corners of the pan, repair any tears, and then trim the edges and crimp as desired. I like using a small cookie cutter to cut shapes to decorate the edge of my pie. Preheat your oven to 375F and prick the bottom of the crust all over with a fork. Bake for 20-30 minutes, or until the pie crust is golden brown. Cool completely before filling. I have since adapted this recipe to be dairy free, since my familiy's dietary needs have changed. My favorite substitute for the butter so far is half lard, half vegan butter spread like Earth Balance or Melt (I think I like the half lard have vegan butter even better than all dairy butter, so flaky!). You can use any combination of vegan butter spread, shortening, lard, or palm shortening as long as you keep the amount the same. I’m SO happy you enjoyed my Best Gluten-Free Flaky Pie Crust recipe! I’d imagine your butter version tastes rich and amazing. Hugs to you, my friend! Ok Brianna, I NEED to try this. I’ve never been good at pie crust, even before trying to make them gluten-free! Pie crust can be tricky, you just have to be patient and make sure you work with cold ingredients and don’t overwork the dough. I hope you try it! This is awesome! I am going to save this one for sure. No worries Sarah. Thanks for commenting! Gorgeous and no doubt absolutely delicious! I love how you did the edging! Thanks Shirley! I can’t make a pretty crimped edge to save my life. Cookie cutters are the way to go! Hi Brianna! Your crust looks amazing. I have yet to get a pie crust to work out (“easy as pie” seems to mean easy for everyone else but me 😉 so thank you for the tip about using plastic wrap! Thanks Jodi! The plastic wrap makes a world of difference. I love trying new recipes and this looks wonderful! Pinning for my Thanksgiving menu. Thanks! 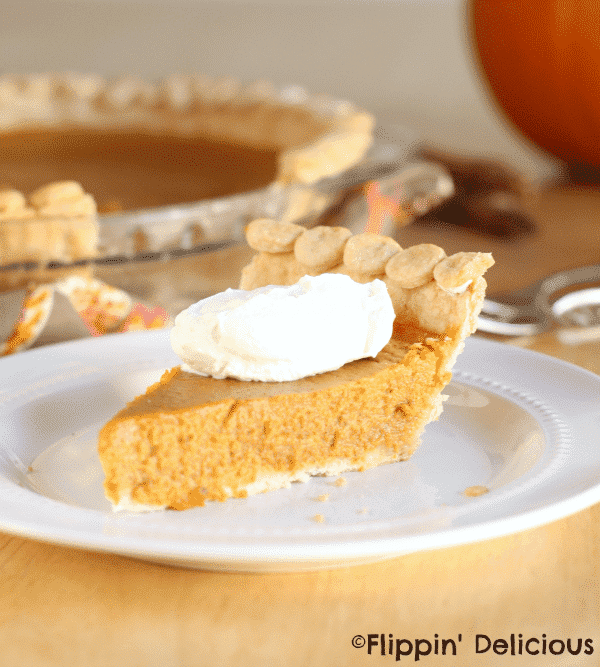 Pie crust and me don’t get along…. I absolutely love Allergy Free Alaska’s version and I know your will be amazing too. Such gorgeous photos too! Pinned to my large GF pumpkin board! Thanks Laura! Pie crust can be so tricky, until recent history I hadn’t had a good gf one. Curious what the difference is between tapioca flour and tapioca starch??? There is no difference between tapioca flour and tapioca starch, they are the same thing. Sometimes they are labeled one way, and sometimes another. Just be aware that potato starch and potato flour are very different. Any substitution for millet flour? Don’t have any on hand and none at our grocery store:( live in a pretty remote area! I’d try substituting more rice flour or sorghum flour. The results won’t be exactly the same, but you should end up with a delicious crust. I bought my millet flour on Amazon. Come to think of it, that’s where I got the Xanthan gum, too. I often buy flour on Amazon. Xanthan gum too! Amazon has everything! So I messed it up by asking hubby to cut in the butter. By the time I got there, he had it all into a ball already! So we attempted to get the ACV mixed in, but didn’t use hardly any water. I had all the flours (I grind fresh). I used this with my GF, DF, soy free pumpkin pie (yes, the crust wasn’t DF!) and it’s the best GF crust I’ve ever had! I used to use the almond flour recipe, but it ends up soggy and falling apart. This was perfect! Definitely saving this. I’m glad that you liked it. I’ve actually been thinking about making turkey pot pie. Sounds delicious! What type of rice flour do you use? White rice? Brown rice? Brand? I’ve used white rice and brown rice flour and both have worked fine. Just depends on what I have on hand. I normally use nuts.com or Bob’s Red Mill flours, but any high quality rice flour should be just fine, no matter the brand. Gluten Free or not, I’ve been looking for the best pie crust recipe all my life. I don’t have a gluten allergy but I feel so much better when I don’t eat it. Can’t wait to try it! Thanks for sharing at Inspiration Thursday! Have a great day. Hi Shelley, My enchilada sauce is in my 10 minute Enchilada post. I hope that you enjoy it. I made a double of this, two pies for thanksgiving! Oh my! I am hooked, just like real crust, could not tell the difference, flaky, light, holdable! Isn’t it a great feeling to eat pie like before going GF? I’m so happy that you loved it! I don’t know how to thank you enough! Ever since I found out I was celiac, I have been searching for a recipe for pie crust. I have used store bought mixes from Glutino, but they are not always available. I have tried making my own with different flour mixes but they always crumble, leaving me so frustrated. Today, I decided to try yours for traditional French Canadian Tortiere. I doubled our recipe as I needed a top and bottom. All I can say is that it was so easy to work with and I now have a very flaky buttery crust which reminds me of my mom’s gluten filled crust. THANK YOU THANK YOU THANK YOU! You are so very welcome Tanya! I am so glad that you have used my recipe with such success! The pie crust was better than I hoped. I have been baking GF for about 8 years now and forgot how flakey a crust could be. I used it for a turkey pot pie (a variation on your chicken pot pie). I am glad that you loved it! I made a cherry pie this weekend with it. It is great to have a flakey crust again. Turkey pot pie sounds delicious! I can give you some similar flours to try substituting, but I haven’t made this recipe with different flours. I would try more millet or rice flour instead of the sorghum and potato starch or cornstarch for the tapioca. Good luck! If you try it be sure to come back and let me know what did/didn’t work. It may be helpful to others. Will a GF all purpose flour mixture be alright to substitute for all the other flours in the recipe? For this specific recipe I don’t recommend an AP GF blend. Whenever I used an AP blend it my crust wasn’t tender and flaky. The particular balance of starches and proteins makes a big difference in this particular recipe. I’d like to make a few pies and freeze them. How well does this crust freeze and defrost? Hi Kim! I haven’t ever tried freezing this crust, so I do not know how it would work. I have only refrigerated the pie dough for several days before rolling out the crust, which worked great. You probably can freeze a pie and then bake it, I just don’t know what your results would be since I have never done that. If you try freezing pies before baking them please comment back so that everyone else can know how it worked out.